Something’s in the air: writers talking about that dreaded moment when the ideas get stuck. 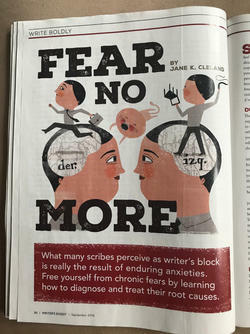 The September issue of Writers Digest features Jane K. Cleland’s insightful take on writer’s block. Definitely check it out. In the meantime, I canvassed my fellow Miss Demeanors to find out what their favorite tips are for pushing through the times when your writing doesn’t work like a faucet. Their answers are helpful, concrete, and fresh (thank you, Paula). Susan: I’m not sure if I was given this advice or simply figured it out during teaching, but I do think the best thing to do is to put your character in the middle of a scene and let her surprise you. One of my favorite exercises in class is to have students imagine their characters are late for something. Anything. What do they do? It’s fascinating to me how that can lead to so many inspirations. Alexia: I forget who told me this or where I read it: “Open a door.” If a door opens, someone or something has to enter or exit (or there has to be a reason why the door opened but no one came or went). Tracee: I agree! Sometimes we need a specific prompt to get past a block- arriving late or going through a door are perfect. I keep close track of my as written outline and then any overall outline so when I’m at a roadblock I usually walk my way through it- visually on a chart/notes on the wall. This way I can perhaps see opportunities that I’d missed or forgotten! Michele: Fear is my biggest block. I deal with it in writing and in life. I was surprised when I read Ann Cleeves still gets scared and tickled when she responded to my comment on Twitter the other day. Writers are so generous. The other piece of advice comes from Lee Child, but often repeated and shared by our own Paula Munier. Write the slow parts fast and the fast parts slow. Now, that is a practical gem. Cate: I outline a lot, so I have an idea of what I am going to do each day. Often, the characters and writing go in a different direction that forces changes to the outline, but having one keeps me from waking up and thinking: where was I going with this. Robin: For me, it depends on the blocker. If I’m getting hung up on words themselves, I recall what someone once said to me, “just say what you mean and fix it later.” If it’s plot, then I’m like Tracee. I keep a cast list in a text file open where I can see it so I can refer to it easily to look for opportunities to complicate the lives of my main characters. I start with the question of what motivates each person then either deprive them of what they want or make them wish they’d been more specific. Paula: I’ve become a big fan of the voice recorder app Rev, which allows me just to talk through a scene and then they transcribe it for me and send it to me. A real person does it, putting in the quotation marks and the paragraph indents and all the things I don’t want to think about when I’m just playacting my way through a scene.I download it into a word document and then I have something to edit and I’m happy again.The app is inexpensive, and they only charge a dollar an audio minute for transcription so for me it’s a very good deal. I can use it when I’m walking the dog or driving or washing the dishes or whatever. I use it a lot in hotels when I’m traveling, too. This allows me to get more work done, faster. And since it feels like I’m just talking to myself (which I am very good at) and not really “writing,” it eliminates the fear factor altogether.